Shirdi Sai Sansthan Brisbane Ltd. is a charitable and non-profit organisation purposely founded with a vision to build a place of worship totally dedicated to Great Guru and Philosopher – Shri Shirdi Saibaba for devotees of Greater Brisbane. Our objective is to create a serene spiritual environment for Sai devotees to perform regular Sai Aartis, Bhajans and meditation. We also intend to construct a cultural centre to encourage Indian art, music, literature and spiritual education. 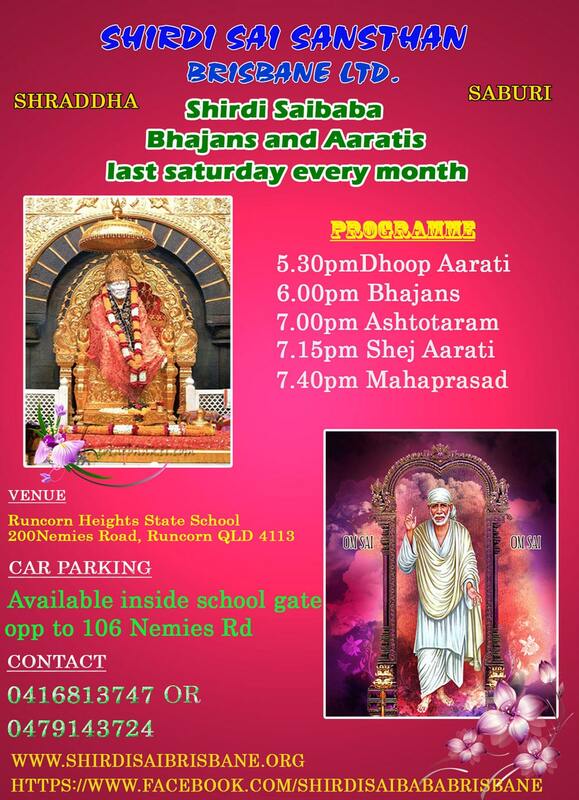 Our organisation conducts Shirdi Sai Aartis and Bhajans every last Saturday of the month and during special festivals from 5:20 pm to 7:30 pm at Runcorn Heights State School – 200 Nemies Rd, Runcorn QLD 4113. The program includes aartis, bhajans, and a short pravachan followed by Mahaprasad (free vegetarian dinner).